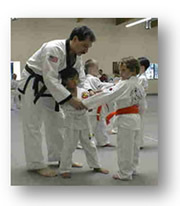 THE BEST IN MARTIAL ARTS EDUCATION. Programs are age specific and are designed to maximize the physical traits along with building and developing good mental skill sets. we are the right choice for you and or your family when looking for fitness, self-defense, learning foundations or the advanced skills of martial arts . Call us at (858) 487-6470 or register here online . Burn over 900 calories with the workout that packs a punch. Complete the online registration or call (858) 487-6470. Master Chris Brandt, Master Janet Manna or Instructors. Save by purchasing blocks of lessons. Register online or call (858) 487-6470.